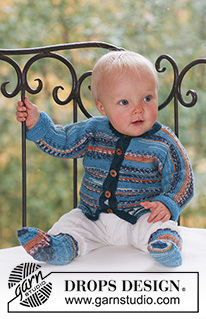 Go to original pattern for design DROPS Baby 16-19. DROPS POINTED NEEDLES size 4.5 mm – or size needed to get 18 sts x 23 rows in stocking st with 1 thread of each colour = 10 x 10 cm. DROPS POINTED NEEDLES size 3.5 mm (for rib). DROPS WOODEN BUTTON no 513: 5-5-6 (6-6) pcs. 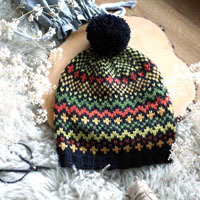 DROPS DOUBLE POINTED NEEDLES size 2.5 mm – or size needed to get 26 sts x 34 rows in stocking st =10 x 10 cm. 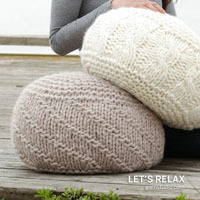 You can get the yarn to make this pattern from	13.00£. Read more. Cast off for buttonholes on right front band. 1 buttonhole = K tog 2nd and 3rd st from mid front and make 1 YO. NOTE: the last buttonhole is made on neckline. 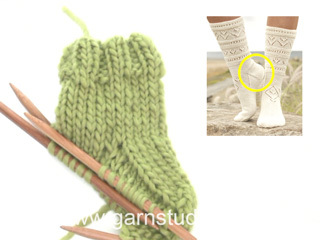 Cast on 52-60-64 (72-80) sts (includes 1 edge st each side) on needle size 3.5 mm with 1 thread of each quality. Work first row as follows (= RS): 1 edge st in garter st, * K2, P2 *, repeat from *-*, and finish with K2 and 1 edge st in garter st. Continue like this. When piece measures 3-4-4 (5-5) cm change to needle size 4.5 mm and continue in stocking st , AT THE SAME TIME dec 5-7-6 (9-9) sts evenly on first row = 47-53-58 (63-71) sts. 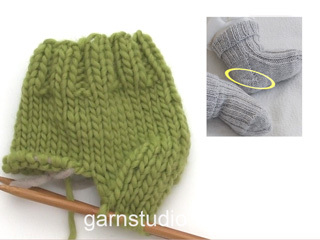 When piece measures 18-19-22 (25-28) cm cast off for armhole each side at the beg of every row: 3 sts 1 time, 2 sts 1 time and 1 st 2-3-3 (3-4) times = 33-37-42 (47-53) sts. When piece measures 27-29-33 (37-41) cm cast off the middle 17-19-20 (21-21) sts for neck and complete each side separately. Work 2 rows on remaining sts on shoulder and cast off. Piece measures approx 28-30-34 (38-42) cm. Cast on 30-34-38 (42-46) sts (includes 1 edge st at side and 5 front band sts towards mid front) on needle size 3.5 mm with 1 thread of each quality. Work rib as follows from the side (first row = RS): 1 edge st, * P2, K2 *, repeat from *-* and finish with 5 garter sts on front band. When piece measures 3-4-4 (5-5) cm change to needle size 4.5 mm and continue in stocking st with 5 front band sts in garter st, AT THE SAME TIME dec 3-4-5 (7-7) sts evenly on first row (do not dec on front band) = 27-30-33 (35-39) sts. 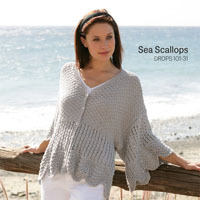 When piece measures 18-19-22 (25-28) cm cast off for armhole at the side as described for back piece = 20-22-25 (27-30) sts. 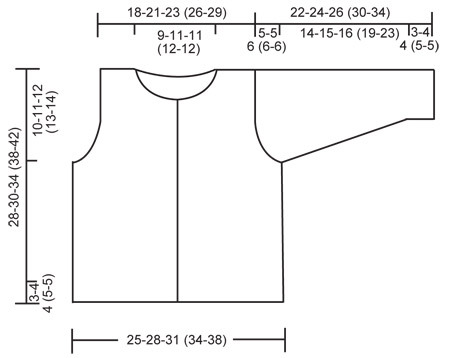 When piece measures 24-26-29 (33-36) cm slip the 7-8-9 (9-9) sts towards mid front on a stitch holder for neck. Cast off to shape the neckline at the beg of every row from mid front: 2 sts 1 time and 1 st 3 times = 8-9-11 (13-16) sts left on shoulder. Cast off when piece measures 28-30-34 (38-42) cm. Cast on and work like left front piece, but mirrored. REMEMBER BUTTONHOLES ON FRONT BAND – SEE ABOVE. 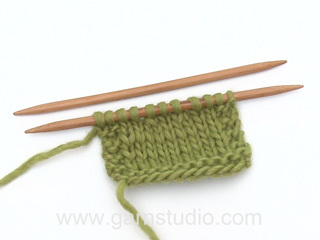 Cast on 30-30-34 (34-38) sts (includes 1 edge st each side) on needle size 3.5 mm with 1 thread of each quality. Work 3-4-4 (5-5) cm rib, K2/P2, with 1 edge st each side. Change to needle size 4.5 mm and continue in stocking st, AT THE SAME TIME dec 4 sts evenly on first row = 26-26-30 (30-34) sts. AT THE SAME TIME when piece measures 5-5-6 (7-9) cm inc 1 st each side and repeat the inc on every 4th row a total of 6-8-8 (9-9) times = 38-42-46 (48-52) sts. When piece measures 17-19-20 (24-28) cm cast off to shape the sleeve cap each side at the beg of every row: 2 sts until piece measures 22-24-26 (30-34) cm, cast off remaining sts. 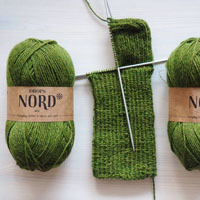 NECKLINE: Pick up 48 to 68 sts (incl sts on stitch holders at front, no of sts divisible by 4) round neckline on needle size 3.5 mm with 1 thread of each quality. K 1 row from WS and continue as follows from RS: 5 garter sts, * K2, P2 *, repeat from *-*, and finish with K2 and 5 garter sts. AT THE SAME TIME when neck measures ½-1-1 (2-2) cm cast off for 1 buttonhole in line with the others on front band. Continue until neck measures 2-3-3 (4-4) cm, cast off. ROW 4 (= WS): Work row until 5-6-6 (6-7) sts remain, slip next st as if to P, P1, psso, turn piece. Continue to dec like this with 1 less st between each dec until there are 8-10-10 (10-12) sts on row. Dec as follows before rib: K2 tog. Dec as follows after rib: slip 1 st as if to K, K1, psso. Cast on 44-48-48 (52-56) sts on double pointed needles size 2.5 mm with Fabel. Work 7-8-9 (10-11) cm rib, K2/P2. Now keep the first 18-22-22 (22-26) sts on needle for heel and slip remaining 26-26-26 (30-30) sts on a stitch holder = upper foot. 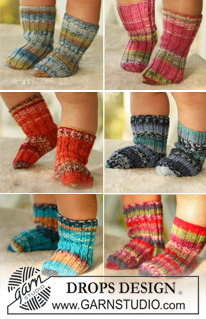 Continue back and forth on heel sts in stocking st for 3-3½-4 (4-4½) cm. Insert a marker in piece. Now dec for heel – SEE ABOVE. After heel dec pick up 8-9-10 (11-12) sts on each side of heel and slip sts from stitch holder back on needles = 50-54-56 (62-66) sts on round. Continue in rib on the 26-26-26 (30-30) sts on upper foot and stocking st on remaining sts. AT THE SAME TIME dec 1 st on each side of rib – SEE DECREASING TIP-1 – on every other round a total of 5-7-6 (7-9) times = 40-40-44 (48-48) sts. Work K over K and P over P until sock measures 7-8-9 (10-12) cm from marker on heel (3-3-3 (4-4) cm remain to finished measurements). Insert a marker each side with 20-20-22 (24-24) sts on upper foot and 20-20-22 (24-24) sts under foot. Continue in stocking st on all sts, AT THE SAME TIME dec 1 st on each side of both markers – SEE DECREASING TIP-2 – on every other round 3 times and then on every round 5-5-6 (7-7) times = 8 sts left. Cut the thread, pull through remaining sts and fasten. 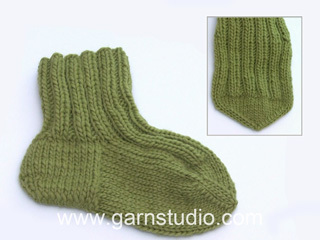 Sock measures approx 10-11-12 (14-16) cm.